We were invited to take part in a festival in Trillke Gut, a living co-operative of approximately 50 adults, housed in an old boarding school on the outskirts of Hildesheim. The invited artists were asked to respond to the political text ‘Free Cooperation’ by Christoph Spehr. Spehr makes the suggestion that politics be returned to the kitchen. Trillke has several kitchen/living-rooms, which function as the central rooms around which the building is nominally divided into smaller living units. These smaller ‘flats’ are known by the name of their kitchen. 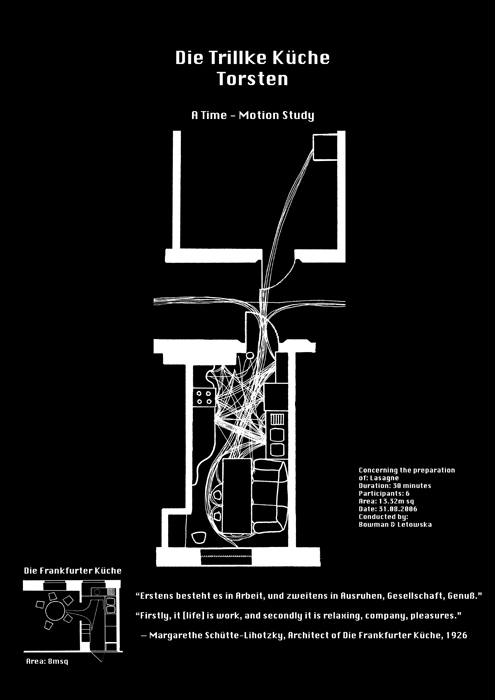 Inspired by The Frankfurt Kitchen, we decided to make time motion studies of the Trillke kitchens. These were presented in the form of diagrams and text on seven monochrome posters. After the main exhibition of the ‘Interact’ project, we returned a copy of each poster to the people in its kitchen. In some of the kitchens the posters are still up.